Alpenglow Escape is the quintessential, boutique Montana townhome! This perfect blend of luxury finishes are awaiting you for your next Big Sky Escape! Located just minutes (.5 miles) from Big Sky Resort, nestled in a wooded area prime for wildlife viewing, this townhome is great for large families with the convenient Skyline shuttle taking you to the resort in 5 minutes. Take in the breath-taking views of Lone Peak from deck and our outdoor private hot tub. 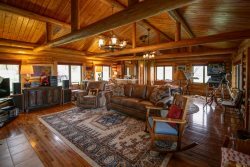 - Outstanding location - Minutes from Big Sky Resort with amazing views of Lone Peak, 6 miles to Big Sky Town Center, 58 miles to West Yellowstone Entrance. - Electric Range,Coffee Maker, Toaster, Crock Pot, Blender, Roasting Pan, Bakeware, 8 Place Settings, Basic Spices, Starter Starbucks Coffee, Trash Bags, Dish Soap, Dishwasher Soap, Sponge, and Paper Towels. DAvid was very responsive and answered our phone calls and texts immediately. Management was very responsive to our needs and requests. Great house for a small group. Bedrooms, Baths and Kitchen are fully equipped with everything you need. Great views of the mountain from the back deck. Hot tub was perfect after a day of skiing. Shuttle to the mountain is a short walk from the house. All around great stay!